This entry was posted in family, music, nature, theatre, travel and tagged Bakersfield, Cabaret, dust, high desert, homesickness, mountains, Niagar-on-the-Lake, pines, Shaw Festival, Southern California, Toronto by joyceahowe/hood. Bookmark the permalink. Yes, the leaves are changing and the geraniums turning back. Today the crows were already cawing for attention as dawn unfolded. The sun has begun to rise and fall a little earlier and a little later with each day. And the quickening of fall misses you. But I suppose that life is a cabaret, old chum! 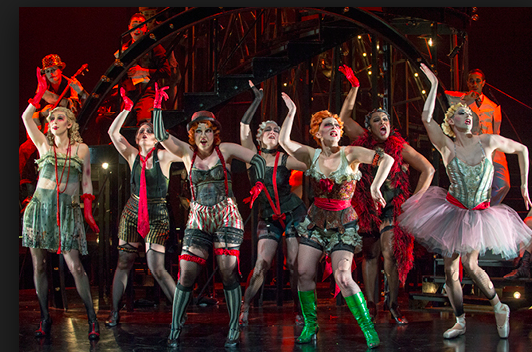 You might as well kick up your heels, send your skirts flying and come ready to dance at that Cabaret!! Seems that way. If you can’t be where you want, then love the place you’re near. Thanks for the report.